Good morning ... The Trump budget is coming out, and let's be honest, it does have a few health care cuts in it. And everyone is looking to Congress for a solution on the insurer subsidies — but there are some pretty strong reasons they can't do it in the health care bill. Big Axios event coming up tomorrow morning: House Speaker Paul Ryan is joining Mike Allen for a one-on-one News Shapers conversation. They'll be covering the whole political agenda, of course, but health care is bound to come up. RSVP here. Bob Woodward will be joining Mike too, but I can't figure out what they'll talk about. It assumes the House health care bill becomes law. 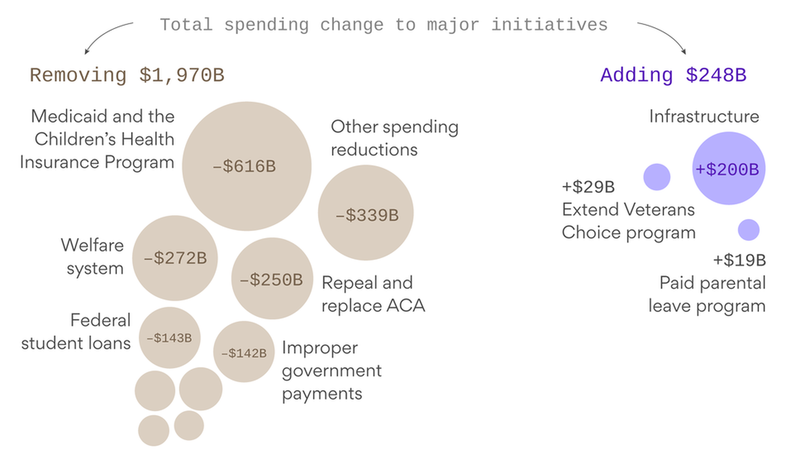 By Trump administration accounting, it saves $866 billion on health care spending over 10 years through the repeal of the Affordable Care Act. That includes $610 billion in Medicaid cuts and $5.8 billion in savings from the Children's Health Insurance Program — again, by Office of Management and Budget accounting. But OMB director Mick Mulvaney said at a press briefing yesterday that "we go another half a step further and ratchet down some of the growth rates" for Medicaid that are assumed in the House bill. It assumes that CHIP is extended through 2019 — but doesn't assume the program will be around after that. It assumes that Planned Parenthood would be defunded, because that's what's in the House bill. Yes, but: Even Mulvaney admitted at yesterday's briefing that Congress isn't going to pass the budget exactly like this. He can't even guarantee that it will pass the health care bill: "We're making a bunch of assumptions here." Why it matters: This is nothing more than the Trump administration's wish list. Don't kid yourselves: Congress will write its own budget, but it does have to pay attention to the administration's wish list. Mulvaney made a point at yesterday's briefing of explaining why the budget doesn't have Social Security or Medicare cuts. He said he took a list of possible entitlement cuts in to Trump, and all of the ones Trump rejected were Social Security and Medicare. "He said, 'I promised people on the campaign trail I would not touch their retirement, and I would not touch Medicare,' and we don't do it," Mulvaney said. So what about Medicaid — which Trump also promised not to cut? Mulvaney didn't try to pretend that Trump had never said it. He just suggested that circumstances have changed. "The president has made it very clear that he supports what the House is doing" on an ACA repeal, Mulvaney said. "Once the president said, 'I support the American Health Care Act,' part of that was Medicaid reform." What Trump said: CNN has the video of him at a campaign event in 2015: "Save Medicare, Medicaid and Social Security without cuts. Have to do it." The Trump administration and health insurers don't agree on a lot, but they definitely agree on one thing: It's up to Congress to solve the ACA insurer payments problem. That's the bottom line now that the administration and the House have asked for another 90-day extension in the lawsuit over the cost-sharing reduction subsidies. From the Trump administration: "Congress could resolve any uncertainty about the payments by passing the AHCA and reforming Obamacare's failed funding structure," HHS spokeswoman Alleigh Marré said. From insurers: "It's time to calm the waters of the Marketplace. Congress can do this by appropriating funding for CSRs," or cost-sharing reduction subsidies, Association for Community Affiliated Plans CEO Margaret Murray said. Just one problem: Doing that in the ACA repeal and replacement bill probably isn't going to work, even if Congress wanted to do it there, Caitlin Owens reports. That's because it's a budget "reconciliation" bill, so anything in it has to have some budgetary impact — except it assumes that the subsidies are already being paid. So if Congress wants to do it, it'll have to find another way. Read Caitlin's story here. Between the lines: Aside from whether Trump wants to pay for the subsidies, there probably won't be a permanent solution unless Congress provides the money — because it's hard for the administration to justify continuing the payments if there's still a legal question about whether they were authorized. This post by legal expert Nicholas Bagley is worth a read, because it's a good look at what could happen if the Democratic attorneys general in 15 states and the District of Columbia are allowed to intervene in the insurer subsidies lawsuit. His conclusion: It could allow the lawsuit to move forward even if the Trump administration decides to drop the appeal and stop paying the insurer subsidies — which it could still do. The key, Bagley writes at The Incidental Economist, is not that they'd prevail on the merits — because they might not. Instead, he writes, the appeals court is more likely to question whether the House had the standing to sue in the first place. "That's why the states want [the] court to decide the case quickly: they hope to get rid of the lawsuit once and for all." It's been a heavy flu season for seniors. Federal data show flu-based hospitalizations for people older than 65 are up a lot compared with last year. But it hasn't affected all hospitals equally, Bob Herman reports. Bob noticed a financial document Monday from Banner Health, a not-for-profit hospital system headquartered in Phoenix. Banner executives told bondholders that admissions declined slightly in the first three months of this year. The main reason? "An unusually light flu season, particularly in Arizona." Reminder: All health care is local. And one person's illness is another person's income. Here's an unresolved plot line from the House health care debate: There was a brief controversy over whether the bill was going to make veterans ineligible for health care tax credits. That wasn't true, as I reported at the time: House Republicans were trying to write a regulation into law to make sure veterans could receive the credits, but the budget "reconciliation" rules wouldn't let them do it, so they had to pull that part out. Now they're going to try to pass that part as separate legislation. The House Ways and Means Committee is set to mark up a bill by Rep. Sam Johnson tomorrow to turn that regulation into permanent law. Not really expecting them to have trouble passing it. What we're watching today: Trump releases his full budget for fiscal 2018. Mulvaney briefing at 11 a.m. Eastern. Also, House Energy and Commerce oversight subcommittee hearing on the Zika virus, 10 a.m. Eastern. Livestream here. What we're watching this week: The CBO releases its final cost estimates for the House-passed health care bill, Wednesday. Also, House Budget Committee hearing on Trump budget, Wednesday; House Ways and Means Committee markup of the veterans' benefits bill, Wednesday; Senate Budget Committee hearing on Trump budget, Thursday; House Appropriations agriculture subcommittee hearing on FDA budget, Thursday. Thanks for reading, and as always, let me know what we missed: david@axios.com.